As you return to campus from break, you may notice things look a little different around here and some people may not be located where you last saw them. As usual, Facilities was busy painting, cleaning, repairing and tending to maintenance matters in preparation for the new term. Also while you were away, Campus Planning commenced work on some much-anticipated major projects at South Campus. Though smaller in scope, there are also projects underway at Hillside. Most noticeably, the first floor of the 1111 building is being completely transformed, with the creation of the Mullin Gallery and expansion of popular Foodies café underway. Renovations have also begun on the fourth floor, which will house the Alumni Lounge and Gallery as well as administrative offices. Across the tracks, construction of the Heavin Studio, a state-of-the-art video production space, continues on the basement levels of the 950 building. The Mullin Gallery, Heavin Studio and Alumni Lounge and Gallery are being funded through generous donations to the College. Here’s a quick rundown of what has happened, who has moved, what is open, what is closed and what is planned. Portions of the first-floor lobby, including the hallway and restrooms, are offline during construction. Restrooms are available on all other floors. Foodies will remain open during construction and is accessible from the exterior entrance. Some areas on P1 and P2 parking levels will be intermittently coned off. 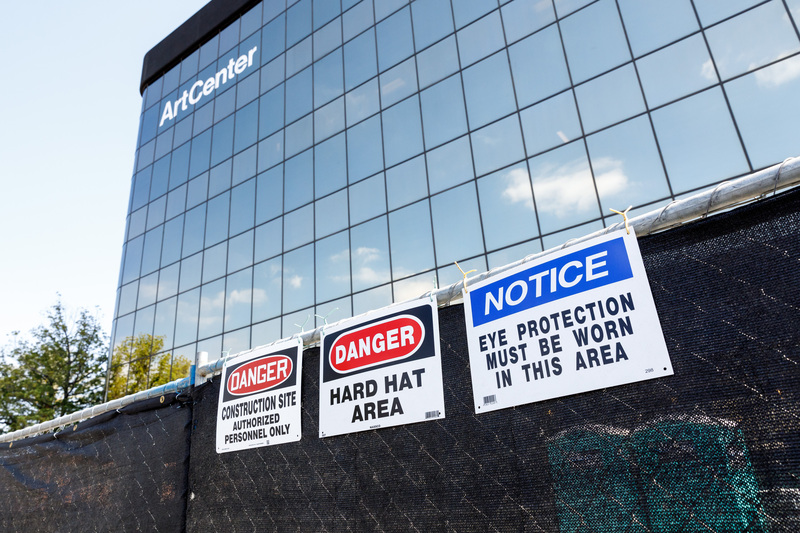 The surface lot has been fenced off and will be unavailable for ArtCenter use for the duration of construction. Visitors can park on P1 or P2. Application Services has moved to suite 440. The conference room in suite 470 has been converted to office use and is no longer available. Development has moved to suites 445 and 470. Auxiliary Services has moved to the second floor, suite 220 (through August 2018). Environmental Health and Safety has moved to the second floor, suite 220 (through June 2018). Director of Security Jim Finch has moved to the second floor, suite 220 (through June 2018). Facilities has moved to the second floor, suite 220 (through August 2018). Campus Planning has moved to the second floor, suite 220 (through August 2018). Digital Teaching and Learning (DTL) has relocated to the second floor of the 950 building and they now occupy rooms 200, 201, 202 and 204. Human Resources will be moving to suite 400 on May 22, 2018. Marketing and Communications remains in suite 480. Please note: contact Jennifer Greendale to reserve conference room space in the 1111 building. The Application Services conference room has been converted to office space and is offline permanently. The conference room in the old Development suite is available. The conference room in the old Campus Planning suite is available and equipped with a Highfive video conferencing system. This room can be reserved on Inside through Roombook. There are conference rooms available on the second floor. Construction of the Heavin Studio is ongoing on the basement levels. CSE’s counseling office has been relocated to room 251 from room 202. Digital Teaching and Learning (DTL) moved from the 1111 building to rooms 200, 201, 202 and 204. Room 204 is no longer available as a classroom or conference room. Soil testing and investigation work is ongoing and will occasionally impact parking. Please avoid all coned off areas. At long last, the Annex building is offline. A visitor information booth has been installed at the entrance of campus. This is an exciting time for the College but we also understand that construction can be disruptive and we appreciate everyone’s patience and understanding. Every effort is being made to minimize interference with our day-to-day activities, including scheduling work for nighttime hours as much as possible. Stay tuned for updates as these projects progress.